Leaks? Tears? We’ll Fix It! Count on us to fix any damage with your ducts and have them professionally replaced when needed! Every ventilation system has ducts running across the house or building, through which the system is able to ventilate, cool down or warm up all the rooms and areas of the building. This system is called ductwork, and you should think about it as the house's arteries and veins. If one of the ducts (or more) gets blocked by something, whether it's dust or debris build-ups, dead rodents, or anything else for that matter, it will disturb the proper function of the entire system. Sometimes it will only require simple cleaning up to make the problem go away, but sometimes, it will require having the duct in question repaired or even replaced. This can relate to a specific duct, a few of them, and in extreme cases – the whole ductwork. The air duct system and its vents have to be cleaned up every now and then, to make sure the air can flow through it freely and that it arrives where it should clear and clean. But over time, materials weaken or sustain some kind of damage, which renders them less effective. In such cases the impaired ducts must be fixed or even replaced to regain system's efficiency.When the ductwork isn’t in good working order the air quality throughout the premises decreases, ventilation and heating and cooling systems have to work harder and consume more energy, and the building's overall efficiency is compromised. In order to understand what exactly the condition of the air duct is, it is recommended to contact our professionals, so they can identify and pin-point the problem and offer appropriate solutions. When you call for professional service, it should start with hearing what you feel might be the malfunction – the system won't ventilate the house, one canal is blocked and so one room remains unaired, and so on. Then, the technician should proceed with examining the rest of the system and identifying the problem causing the malfunction. Once the problem is identified and well understood, our technician will inform you what the best solution to the situation is – whether it's fixing one damaged duct or replacing it altogether. When you hire our professionals, it will be easy for them to explain what seems to be the problem and how they can solve it without dragging you into unnecessary expenses. Whether your home's air ducts need to be cleaned, fixed or replaced, we can help! Call us at Duct & Attic Cleaning Experts and our professionals will be of assistance, with the best services in town for the best prices in town! How complicated are heating duct repairs? In one word – very! Although the actual repair can be easy for experienced technicians, identifying the cause of problems with the heating system, finding the location of the ducts that need to be repaired and accessing them are not simple and should be left to the professionals. Usually the problem starts with a cold room or different temperatures throughout the house. This can be due to duct leakage that caused the air to escape before reaching the room, ducts that are not insulated sufficiently, or unbalanced airflow. A trained technician is able to test the entire system including the airflow and identify leakage points, and then seal those areas using proper material and upgrade the insulation if needed. 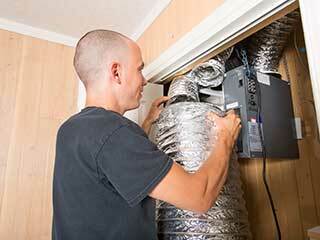 How do you check ductwork for leaks? Checking your air ducts for leaks is an involved and a time-consuming task but can be done with the right tools and some determination, as you need to physically access and inspect the entire system. This would involve wearing protective clothing, as well as a dust mask. However, unless you're a professional, you can end up damaging some part of the ductwork or the insulation, which will require expensive repairs. Keep in mind that professionals have special tools to carry out more in-depth internal inspection for ducts than you will be able to, especially parts of the system located inside walls and bulkheads. How long does ductwork last in a house? In most cases, the ductwork in a house can last ten to fifteen years. It is important to keep the system in good repair, clean and in optimal condition so that their age will not negatively affect the functioning of the heating, cooling and ventilation system. Leaks, breaks and damaged ducts will force the HVAC system to work harder and will increase your energy spending and affect the quality of the air in your house. If the system is more than 15 years old, get it inspected by a professional and ask for their advice. Don’t wait for serious problems to arise. If you notice that your energy bills are starting to increase, or the indoor air quality feels like its worsening, or if you can smell mold or musty smell, it might be time for a full ductwork replacement.